I had an episode with Bell's palsy a number of years ago, but I do not believe it has any connection with stroke. I just mention it to illustrate what weird afflictions i have suffered in the past. Bell's palsy is a partial paralysis of one side of the face, characterized by loss of motor control of one side of the mouth, and one eye lid. Swelling and inflammation of the seventh cranial nerve, where it passes through a small aperture in the face of the skull, is thought to cause this paralysis. 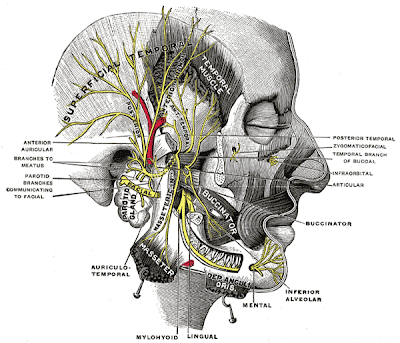 The restriction due to swelling where the nerve passes through the small opening results in impaired circulation, which causes paralysis of the nerves which connect these facial muscles. The overall effect is a face that is droopy and flaccid on one side. The most serious and painful consequence for me was loss of control over my left eye. I could not move the eye lid, except by manually opening or closing it with my fingers. Lack of ability to blink also left the eyeball dry and irritated much of the time. I resorted to wearing a sinister-looking eye patch. Fortunately, Bell's palsy proved to be a short-lived temporary condition. After a frenzied trip to the emergency room with complaints about the paralysis, the doctor laughed at my rueful expression and diagnosed "droopy face". He gave a prescription for anti-inflammatory steroids, and sent me home. The paralysis cleared up and symptoms gradually disappeared over a few weeks. I only wish the current affliction was so ephemeral. I've told this story before, so if you've seen it, I hope I won't weary you with it. When my daughter was 3 1/2, she lost her swallow reflex and developed a tongue thrust that pushed most of the food I put in her mouth back out. It took forever just to get the tiniest bit of food into her. She began losing weight rapidly. Doctors said there was nothing we could do and were pushing for a feeding tube. One day, as I sat trying to feed her, I became frustrated with the seeming impossibility of the situation. I looked up at the ceiling, spread my arms wide, and said, "There must be a simple solution for this problem. Show me what it is!" A memory came to me. When I was a kid, much of the medicating of the family pets fell to me. I would open the dog's mouths, place a pill back as far as I could on the dog's tongue, then close the mouth, hold the muzzle, and massage the throat, which produced an involuntary swallowing reflex. Down would go the pill. I wondered if that same trick might work with my daughter and tried it right then. I opened her mouth, shoved the food in, tipped her jaw up so she couldn't open her mouth, and massaged her throat. She swallowed. Down went the food. For the first time in weeks, I managed to get a meal into her. Over the next three days, with me massaging her throat, her swallow reflex re-engaged on its own and she began taking in a lot of food. That caused other problems we then had to solve, but we avoided the feeding tube for the time being. We also developed a special formula for her to facilitate her eating. We might have to resort to a tube later in her life, but for now, we're glad to not have to deal with that on top of everything else. Nothing can reverse the extent of the brain injury she suffered, but much that we did helped her find ways around it. Eventually, the relentlessness of the work, the difficulty of it, and the lack of good help slowed my husband and I down, so her progress slowed. Besides her, we had other troubles that absorbed so much of our energy. But I know that if life hadn't worn us down as much as it did, or if other factors had been more potent, like the care her doctors and therapists gave her, she would have achieved much more than she has. I also know that if she were born, say, fifty years from now, after some bright, motivated medical researcher had developed a vaccine for the virus that nearly killed her in the womb, her chances of being born whole would be greater. Or even if she wasn't born whole, fifty years from now, rehabilitation procedures will be more advanced and her chances would have been increased by that route. Sometimes, we're casualties of the times we're born into. But the one of the most important lessons I learned was that life wants to be lived. Teah's brain worked hard accomplishing some rewiring around the very extensive damage it suffered. Why? Why does the brain do that? You do still have to figure out what's going on that's causing the strokes and try to change that. My sister's daughter developed a neurological condition the docs took too long identifying. My sister did her own research, discovered the name for the pathology, took it to the docs and said, "This is what she has. Treat it." Turned out she was absolutely right, the docs did have an effective treatment, and the daughter's all right. Like I said and you know, you have to find out for yourself what's possible and what isn't. I understand the weariness with the doctor visits. They had us running every which way, and for the most part, all it accomplished was further strain on our family. Physical therapy with a good (even gifted) PT offered us the best results. My little trick of re-engaging her swallow reflex was a PT triumph, not a medical triumph. At least your life was saved and you got the migraine medication out of your run through the maze. I have lots more stories like this one, including how we appear to have stopped her seizures w/out meds, another case of learning to identify the limits that showed themselves and building carefully, over time, on those limits to extend them. Hi Jim! My Grandpa had Bells Palsy for as long as I knew him and my uncle currently has it. The only issue grandpa had was when he was eating.... well it wasn't an issue for him so much as it was for the rest of us at the table! haha. "Grandpa, I can see your food..." Ew!